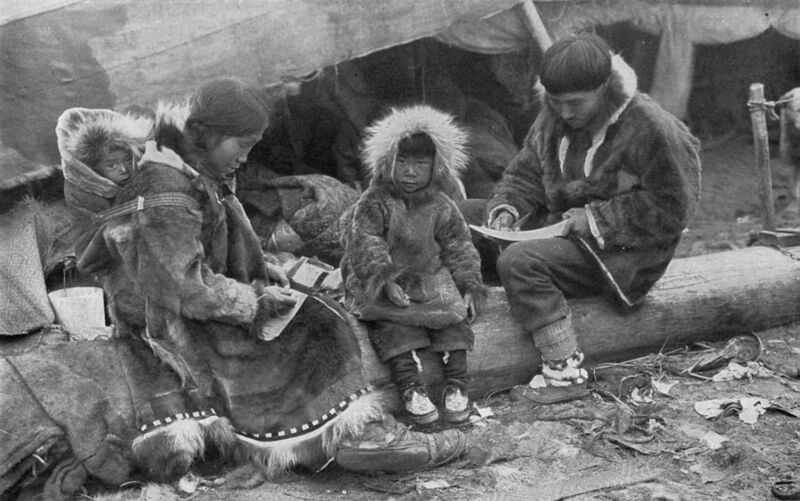 This week’s image is of an Inuit family going about their business in 1917. Following last week’s quite majestic image, this week we have an image that is altogether more humble. Historical context seems less relevant for an image as endearing as this. Simply put, the image is of an Inuit family from 1917. Far away from the realities of the Great War, this Artic scene is centered on a boy staring into the camera. It almost looks like he is about to smile. At least it appears that there is a smirk about to appear. His parents are occupying themselves and working away – probably in the same way that Inuit people had been doing for centuries. Almost hidden in the left is a small baby, in the baby’s mother’s pouch. They are all in what appears to be traditional, warm clothing. "AN ESKIMO FAMILY. Tenderness and responsibility in their treatment of children is a virtue of the Eskimo which binds them closer to the brotherhood of civilized peoples." The image originally appeared in National Geographic in 1917 and is by George R. King.